The STATIM 2000S boasts an 8-minute cycle and has the added advantage of employing a fully removable chamber so you can aseptically transport a set of freshly sterilized instruments directly to the procedure area. The STATIM 2000S is fully automatic. Simply select one of the three sterilization programs and with a single touch of the keypad, begin the cycle. An advanced microprocessor controls all functions and maintains optimal sterilization conditions, from start to finish. 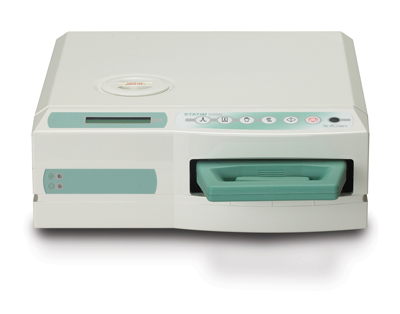 SciCan’s STATIM cassette sterilizers have a biological effectiveness that has been proven in tests for hollow and solid instruments at many internationally recognized institutes in Canada, the United States, and Europe.